High schooler Paige Leavy turned 15 this past summer, and decided to make the occasion memorable not only for herself but for others in the tennis community who strive to enjoy the "Sport For a Lifetime" despite disabilities. 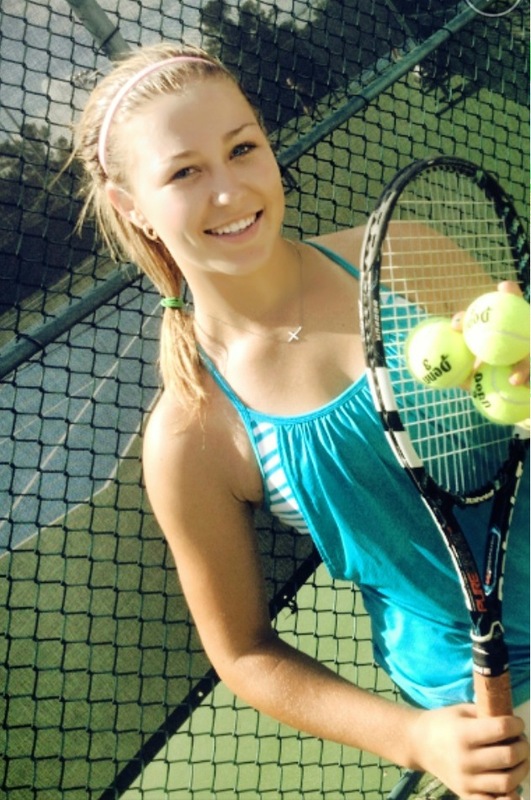 "I created a free, three-day special needs tennis camp for children and adults," said the student of Tampa Preparatory School, who is also a competitive junior tennis player. "I felt the need and desire to give back to the community with a sport that I love, and that I am so grateful to be able to do." The July free adaptive tennis camp for special-needs adults and children was held at the Harbour Island Athletic Club in Tampa, Fla.
"I am really blessed and fortunate to be able to be a competitive tennis player, and I feel a lot of joy when I can see these special athletes perform in the way I know they all can when they are given the opportunity," Leavy said. Travis Leigh, an ambulatory physically-challenged athlete who had never played tennis, was one of Leavy's camp recruits. "I was taken aback that she was so enthusiastic about putting on a camp for people in the disabled community," said Leigh, who played sled hockey but had never tried tennis. "That's what really got me." Leavy organized the camp through the organization Tennis for Fun, which is based in Tampa and Brandon, Fla., and serves adaptive players. "Even if only one camper showed up, I was determined to make a difference," Leavy said. "I presented this idea to my mom and she was very supportive and helped me make this camp happen. I never realized volunteering had such great benefits for not only the campers, but for myself as well. It took a lot of time to put together, but the rewards were enormous." USTA Florida salutes Paige Leavy as the December Volunteer of the Month for sharing the game of tennis with players of all abilities. My earliest tennis memory was..."Winning my first trophy at nine." If I could play tennis with three people, they would be..."Victoria Azarenka, Novak Djokovic, and John Isner." When I am not playing tennis I am..."Focusing on my academics!" My best tennis memory is..."Going to Sony [Miami] and meeting numerous Top 10 professional players." I like to volunteer in tennis because..."I love to see the joy that it brings out in the special-needs athletes that I taught when they succeeded in hitting the tennis ball." 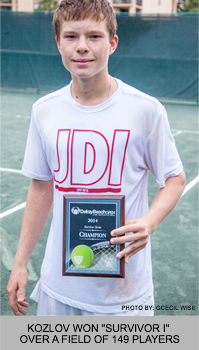 Stefan Kozlov, the Pembroke Pines, Fla., 15-year-old tennis phenom, last week won the "Survivor Series I" pre-qualifying title over a record field of 149 players at the Delray Swim & Tennis Club. Survivor Series I is one of two pre-qualifying tournaments for the Delray Beach Open by The Venetian Las Vegas, an ATP World Tour event. Kozlov found himself down 5-2 in the third set to 18-year-old Spencer Papa, but put on a furious rally to claw his way to a 6-4, 2-6, 7-5 win. "I actually don't know how I got through this match," Kozlov said. "It was one of the toughest matches I have ever had. It was a coin flip really, we were both pretty tired. But I gave it my all." Kozlov is the No. 13-ranked junior in the International Tennis Federation (ITF) world rankings, and along with Papa, trains at the USTA's Training Center Headquarters in Boca Raton. The two have also won a pair of major international doubles titles together this year. Papa is one of the nation's top recruits and recently signed with the University of Tulsa. The Edmond, Okla., native is rated by the ITF as the No. 7 U.S. player and No. 56 in the world. To reach the final, Kozlov won six matches in four days, but didn't face a seeded player until the semifinals when he beat Survivor II champion and No. 8 seed Juan Rocha 6-2, 6-3. In the other semifinal, the No. 4-seeded Papa downed two-time Survivor winner, former USTA Florida US Open Playoffs-Florida winner, and former University of Miami star Eric Hechtman 6-3, 6-2. "I want to congratulate Spencer," said Kozlov, who helped stretch out Papa when the Oklahoman experienced cramping in the final games of the match. "It was an unbelievable tournament." With the win comes a wildcard for Kozlov into the Delray Beach Open's qualifying tournament, scheduled for Feb. 15-16, 2014. The four top finishers in that 32-player field receive automatic entries into the Delray Beach ATP World Tour event main draw. Kozlov will be trying to qualify to play in his second career ATP event. At the 2013 Newport ATP event he took a set off veteran Michal Przysiezny and saved four match points before going down to the 29-year-old Pole. Players will have a final shot at earning a wildcard by entering the "Survivor Series II" pre-qualifying tournament that will be held Jan. 25-27, 2014, at the Delray Swim and Tennis Club.